Enjoy and rejoice in your beautiful surroundings with outdoor furniture that is luxurious and comfortable. The Cayman Teak Table is a long time favorite at Teak Warehouse. Simple, stately and stylish; the Cayman Teak Table is an ideal spot for a morning coffee or for a beautiful dinner for up to four people. We also recommend the Cayman Teak Table for commercial properties such as cafés and restaurants, adding a panaché to your outdoor courtyard. W31" x L31" x H29"
Our elegant Cayman Teak Table is made out of A-Grade Teak with contemporary bowed legs and a pinwheel table top design, making for a charming and inviting table to host up to 4 of you and your guests. Create an utterly desirable duo with the Cayman Teak Table and a couple of teak folding chairs for an easy to move, easy to move set. 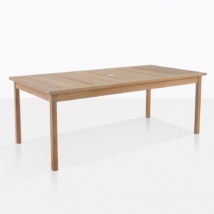 Constructed entirely A-Grade Teak, the Cayman Teak Table is of the highest quality. A-Grade Teak means that the tree has aged over 40 years and more than any other tree, these aged teak trees carry naturally generated sourced rubber and oil throughout the wood, so once it is cut down (following plantation procedures in Indonesia.) it is ready to become the most beautiful, hard-wearing outdoor furniture. A-Grade Teak that has out performed any other wood in its category, our test is in the feedback from our customers for over 20 years! It is not unusual for us to have customers come in and say their bench or table was bought when we opened our doors and it’s still looking beautiful and performing well! 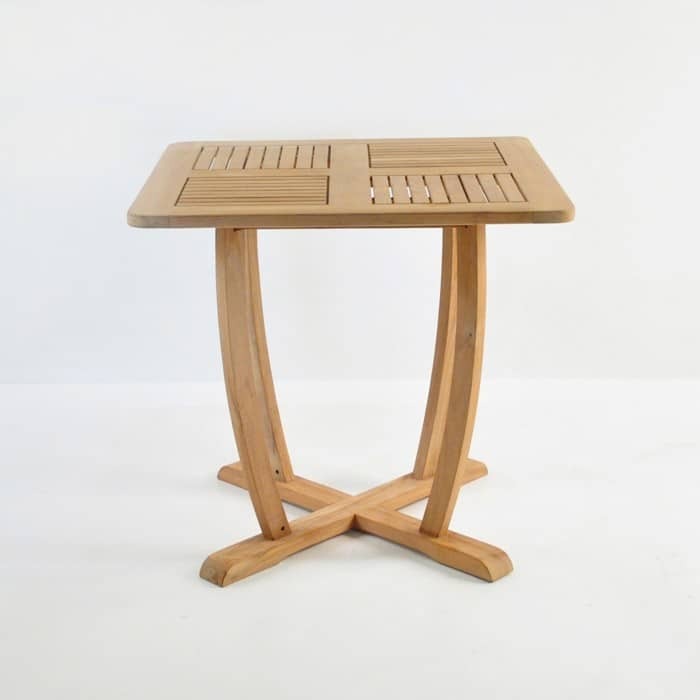 Teak Warehouse does quality control on site, so we can make sure that every item that leaves our store arrives to you looking as beautiful as the pictures on this website. Not only do we supply a fabulous array of A-Grade Teak products, we also have marine grade furniture in other amazing materials so that you may mix and match to your hearts content. 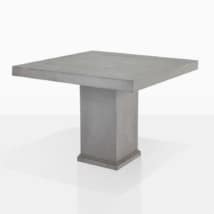 Have a look at our incredible Raw Concrete tables and benches, Batyline® mesh sun loungers and chairs, #316 Stainless Steel chairs, tables and loungers, and vast amount of Viro® All Weather Wicker products and of course stunning Sunbrella® cushions and umbrellas. Set up the Cayman Teak Table in a quiet spot in the garden or on an upstairs balcony in an apartment with a couple of wicker side chairs for a relaxing spot to take your mind off life’s stresses and wrap yourself in the comfort of your surroundings. Complete the look with the addition of some square or rectangular concrete planters filled with scented with herbs or your favorite flower to really add to the ambience. 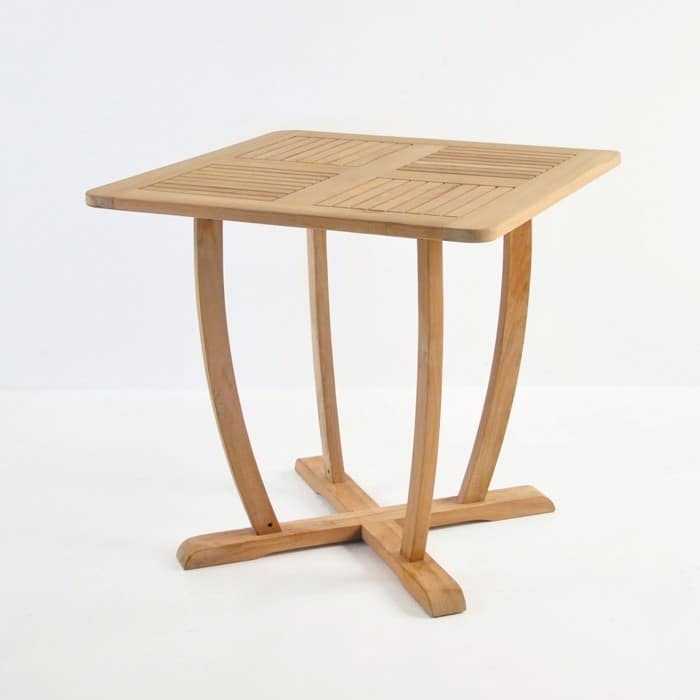 Imagine this adorable table en masse in a large vineyard setting. Your customers are content, sipping your tasty wine, enjoying a cheese plate and taking in the expanse of space in this stable and welcoming environment. Maybe you’ve made the area slightly more contemporary with some cantilever umbrellas and an industrial looking chair, like one of our steel and wicker chairs with a soft Sunbrella® pad for comfort. 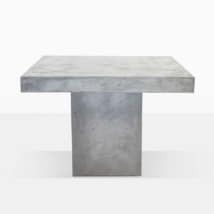 Place a couple of these on the edges of your beach side property; an excellent place to take a moment, breathing in the sea air, sipping a homemade margarita on a hot summer eve as the sun goes down. Pop a couple of teak folding chairs out there too so you’ve got somewhere to rest! The options are endless with tables like this one. The Cayman Teak Table is stunning and simple, add a different material for a contemporary look or keep it traditional with all teak. Whatever combination you decide on, we are confident we have something for everyone! 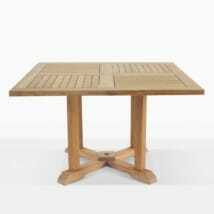 As well as this table, we also carry several teak tables with variations in size and style. To complement them, we have an overwhelming selection of folding, fixed and stacking chairs in a mix of materials, weights, and styles. If you’re nearby stop by and see us, or for those elsewhere, we are only a phone call or email away. Our team of sales representatives are in store 7 days a week and are dedicated to helping you find the best possible configuration to suit you and your home. The Cayman Teak Table is just one of the many elegant café tables available at Teak Warehouse, call us today to order yours!